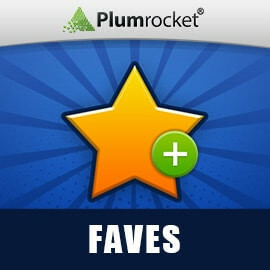 Faves extension is one of the components of successful social shopping strategy. Make your store more user-friendly, allowing your customers to mark favorite items as “faved” and check what other visitors prefer. Customer can view all favorite products and brands on one single page "My Faves". All clicks on social media buttons are intercepted and recorded into database. Faves extension will let you add social media buttons on your store. Do you want to have a proven tool for engaging new customers and increasing sales conversions? With ourInvitations, Live Feed, Faves and Inspiration Wall Extensions this dream can come true. These social shopping extensions represent a sophisticated and interrelated system for your membership site's social media integration. After you add "fave" and social media buttons on the category or product pages of your store, visitors to the site will be able to "like" products, monitor what other visitors prefer, share socially and post inspirational images on your store. Magento Faves extension also provides an easy button management system and allows adding & editing of new and existing social network buttons. Site administrator can also view full statistics of user clicks on all social buttons to better understand customers' preferences. NEW! Customer can view all favorite products, Live Feed items, Inspirations and Brands on one single page "My Faves"
Nice extension that is very easy to configure and use. Worked much better than advertised. As always with Plumrocket extensions - they all work like a charm. Purchasing this app was a good decision! We purchased this extension for our Magento 1 store. And as usual, it worked out-of-the-box on our website without any issues. We needed to re position the buttons and Plumrocket was on hand to help us without any additional cost. I recommend this to everyone. One of the best extentions to have!! This is one of the best extensions to have for my magento shop because it lets our customers add their favorite things from the website. I chose this rating because I have only scene this extension from Plumrocket and no other extension company sells it, and I like the fact that it goes with the Inspiration Wall extension that I will be purchasing soon! I recommend this extension to all the magento shop owners who need to enhance their magento shop for their customers. Thank you guys for developing this tool! I think every web store should have the options which are included in this addon, that's simply a must-have. I agree with the previous review about using "My favourites" option while shopping online. I also want to say that the price of this Faves extension is very competitive. I purchased several extensions from Plumrocket, this being one of them. Giving the user a way to save items for future purchases is something very simple but very necessary. I use my "favorites" on other shopping sites I frequent and absolutely needed it for my store. Faves extends social sharing and provides bookmarking tool that allows users to save products and categories into social wishlist. This extension is socially friendly and easy. Includes a demo and good documentation. It's perfect to turn the boring wishlish into a action driven and fun place to shop. This extension is friendly, and will allow my customers to enjoy their time on my service. Highly recommended to all! I had been looking for an extension with this functionality for a long time. As well as social sharing, Faves can be thought of as a bookmarking tool, that allows your customers to bookmark products or categories for future reference. The Fave button saves the URLs to a page similar to a wishlist in My Account. The one feature I think is missing is the ability to rename it from "Faves" to something else - in my case I would prefer to label the button "Bookmark". But I'm still giving it 5 stars because it's excellent. It's a pleasure to receive such a detailed review from you. We are really honored! As for your note, for now you can use "Translate Inline" feature in Magento to rename the fave button to "Bookmark". Please contact us if you need any help doing so. For the future, we will surely include the renaming labels option into our Magento Faves extension. Thank you again for your time and efforts writing this splendid review! This extension combines several other extensions which each may cost you hundred dollars. It include the like from Facebook, twitter, G+. Best of all. Like and fav this extension and the way this works:) This social media plugin is my treasure. The true solution to enhance Live Feed and Inspiration Wall: use them all in order to reveal the social soul of your e-commerce. The strict connection with main social networks will help to boost your marketing with no additional effort. For those in the market, they know that social marketing works. This extension will have no problem in paying for itself in no time. Yet, I believe the power of it is when you actually combine it with Live feed extension or with Inspirational wall. Why? Because that's when you will actually have visitors and customers actively engaging in your site which will results in a rapid increment of sales. Fixed duplicate faves issue in "my faves" tab when Inspiration Wall Magento Extension is installed. Integration with Plumrocket Invitation Magento Extension. This new feature adds GET parameter in URL's of all social buttons used by Faves module. When user clicks on a Facebook Like (or other buttons), his friends will see a link to your site page. When friends click on this link, they automatically become referrals of a friend who liked your website.